Beautiful blooms but… at the bottom left can be seen a couple of Croton leaves quaking before the pending, overwhelming, onslaught of the Flame Vine from above. 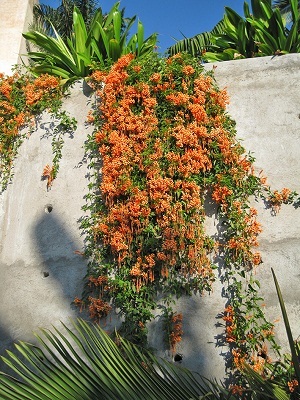 Commonly now grown in tropical and subtropical areas, as well as in mild Mediterranean climates, Pyrostegia venusta is a vigorous liana (a long-stemmed, woody vine, rooted in the soil at ground level, which uses an array of means for vertical support) that makes a beautiful ornamental plant with cascades of orange flowers. Like the Axis Powers at their zenith in the 30’s, these guys strive to take over everything around them! They are, suffice it to say, aggressive and can smother the more benign – so, beware trees, shrubs, and bushes. Mine reach out onto my Date Palms, Crotons and Silk Floss Tree and, regularly, have to be aggressively “encouraged” to not be such expansionists! Nervously peering over its “shoulder” fronds, a Bottle Palm on our Boulder Terrace sees the rapidly encroaching Flame Vine fast growing ever nearer from the Grand Terrace above. The genus name refers to the color of the flowers – pyro (flame) and stege (covering) while venusta means “pleasing”. Another of my secondary research sources asserts that the species name translates as “handsome.” What with its profusion of bright, brilliant and bunched flowers, I would, most assuredly, agree with all of these! 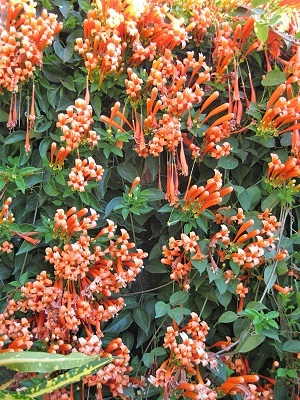 In full bloom, with its medium to dark green leaves and bold, abundantly lush, dense, terminal clusters of two to eight, two to four-inch (five to ten centimeters) long, slender, orange (occasionally yellow), tubular flowers cascading down, it is simply brilliant. Climbing via thread-like tendrils, its shiny, pinnately-compound leaves (somewhat like a feather with parts branching from a central stem) are comprised of two or three leaflets. These ovate leaflets are two to three inches (five to seven and a half centimeters) long with one of them, sometimes, being modified into a terminal tendril. 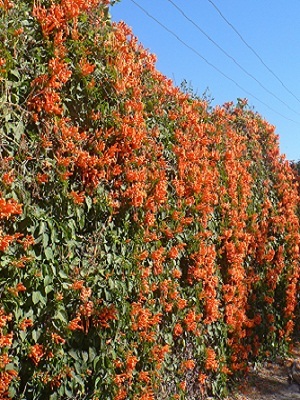 But, at the risk of repeating my earlier warning, when growing the Flame Vine, keep in mind that – in but a short time – it can well cover walls, trellises, arbors, car ports, rooftops, overhead lines …and slow moving gardeners! In his tremendous tome, “The Tropical Look, An Encyclopedia of Dramatic Landscape Plants” (available through our web site via Amazon), Robert Lee Riffle – in my opinion, the quintessential “Plant Person” – said of them, “When it does bloom, there is probably no other flowering vine that is more spectacular, especially if one likes the color of deep orange.” I know of few who would not but fully concur. This one grows on a wall on the highway leading into PV from Manzanillo. Gorgeous, isn’t it?! It can handle a wide range of well-draining soils and likes moderate, regular waterings. You may wish to prune them following their flowering. It can be propagated by cuttings or air layering. These copious, trumpet bloomed vines are salt tolerant and suitable for planting along the coast. And as an aside, it has another climbing cousin – Bignonia magnifica – that boasts large purple or mauve-pink flowers and can be pruned into a bush. Yearly maintenance to remove dead wood is a good idea – after cessation of blooming. I’ve read that scales, caterpillars, and mites can be a problem for the Flame Vine but I have, to date, not experienced such.